Heiser Automotive Group is sizzling hot this summer! Heiser Automotive Group is sizzling hot with savings, vehicle tips and give-away items this summer at all five Southeastern Wisconsin locations. As always, Heiser Automotive Group is committed to giving our customers the best savings via both sales and service. Thus this summer we are offering Heiser’s Summer Sizzliser a great “tune-up” package to help make sure every Heiser vehicle is ready for their next summer road trip. 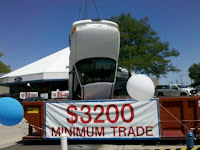 Please check out heiser.com for more details as well as Heiser Toyota of Milwaukee, Heiser Chevrolet of West Allis, Heiser Ford Lincoln of Glendale, Heiser Northpoint Ford on North 76th street in Milwaukee, and Heiser Chevrolet Cadillac of West Bend’s service hours.